Alberta’s huge Boreal Forest Natural Region covers 381,000 km2, more than 57 percent of the entire province. 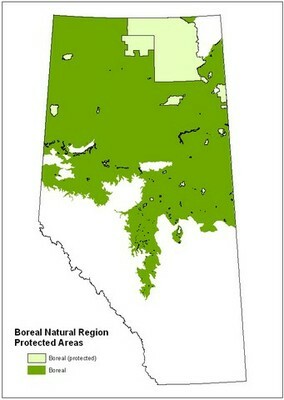 A total of 13.2 percent of Alberta’s Boreal Natural Region is protected, mostly within the huge Wood Buffalo National Park. But this is not necessarily evenly distributed amongst the eight subregions. Protection ranges from 78.2 percent of the Peace-Athabasca Delta Subregion to 1.6 percent of the Dry Mixedwood Subregion. 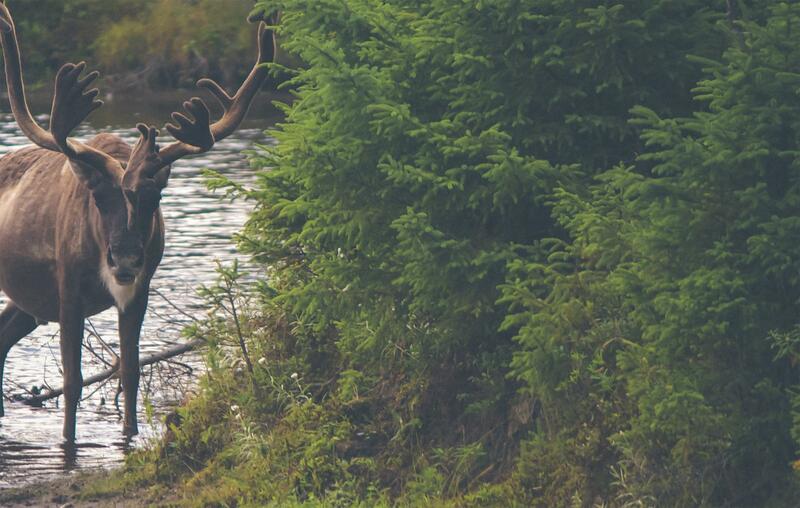 Nationally, the Boreal Forest is Canada’s largest ecosystem, covering 58 percent of the country. It stretches through all provinces except PEI, Nova Scotia and New Brunswick. According to the Boreal Forest initiative, an estimated 208 billion tonnes of carbon are stored in the Canadian Boreal’s trees, soils, water and peat –equivalent to 26 years’ worth of worldwide greenhouse gas emissions. The Alberta Forest Product Association releases the results of their Alberta Forest Usage Survey. The survey was intended to understand “societal values Albertan’s [sic] hold towards their forestlands.” The top four values identified in the survey are replanting/reforestation; protection of wildlife and habitat; harvesting practices that manage ecological impacts; and regulations or restrictions on industrial land use. A report released by Global Forest Watch Canada states that between 1975 and 2001, the annual area logged in Alberta increased by 214%. An article in the Edmonton Journal states, “Bob Fessenden, deputy minister for Alberta Sustainable Development, told a conference on sustainable forest practices that the provincial government remains neutral on certification and does not endorse any single standard.” Lack of certification (such as FSC) reduces the potential buyers of lumber. Canada’s Large Intact Forest Landscapes, a report by Global Forest Watch Canada, states that only 17% of Alberta’s natural, unprotected forests are ecologically intact and untouched by development. The Federation of Alberta Naturalists and The Alberta Centre for Boreal Research publish Richard Schneider’s book Alternative Futures: Alberta’s Boreal Forest at the Crossroads. Schneider states that “the current system of forest management in Alberta is a relic of the 1950s, and is in serious need of repair.” The book represents “the culmination of the [Alberta Centre for Boreal Research’s] first three years of work.” Schneider provides good historical information on the development of Alberta’s forest industry. Whatever Happened to the Alberta Forest Conservation Strategy? by Richard Schneider, Alberta Centre for Boreal Research, is published in Encompass. Schneider provides an update on governmental activity vis-à-vis the AFCS; the primary conclusion is that the government has not implemented any of the strategies outlined in the AFCS, but continues to focus on using forests for their economic values. Schneider does point out, however, that the forestry industry itself is stepping into the void created by government inaction. Forestry companies are responding to the public’s demand for responsible forest management, and have implemented forest certification through the Forest Stewardship Council. The inability of Alberta’s forest industry to manage forests for ecological sustainability due to the activities of Alberta’s petroleum industry. The report concludes that there are strategies to removing these impediments, and calls on government to provide the leadership to ensure the impediments are removed. Three conservation groups (Albertans for a Wild Chinchaga, CPAWS (Edmonton) and the World Wildlife Fund Canada invite forest companies and other stakeholders in the management of forestry practices to attend a meeting on the Forest Stewardship Council and to discuss possibilities for an FSC initiative in Alberta. Alberta Forest Conservation Strategy is published. This 29-page document outlines the vision, goal, and principles of the AFCS, and its focus on sustainability, ecological management, sustainable forest economy, protected areas, range of management intensities, and participation and partnerships. “For centuries to come, Alberta will have vast forest areas, including forest areas with a pristine character, in which natural structures and functions continue to evolve. Forest areas will continue to meet our needs for ecosystem services such as clean air and water, as well as economic opportunity, material goods, recreation, leisure and spiritual connection. Alberta Environmental Protection implements a new permit system for transporting logs harvested on private land. (Alberta Regulation 296/95, Timber Management Regulation). All land holders who plan to harvest their coniferous timber and haul it on a public highway must purchase a permit form; one permit ($10.70) is good for hauling one load. Alberta Environmental Protection conducts a logging truck check stop at the Banff Park gates; five warnings were handed out for mostly minor infractions. A second check stop is held in early February 1996 at various locations in Alberta; there are 14 infractions and one load seized. All of the private timber was being exported to timber processing mills in BC. Forestry Stewardship Council Canada Working Group is created. The Alberta Government creates the Alberta Forest Management Science Council through the Minister for Environmental Protection. The AFMSC is asked to “provide advice to the Land and Forest Service on Timber Supply Protocols, particularly the science base required to change from Sustained Yield Management to Sustainable Forest Management.” The report is published in September 1997. Alberta Environmental Protection introduces a new permit system for transporting coniferous logs harvested on private land. The Alberta Registered Professional Foresters Association puts forth a proposal to license the practice of forestry in Alberta. Premier Ralph Klein sets up a task force of cabinet ministers to find way to curb logging on private land. Environment Minister Ty Lund states that tougher forestry policies in BC are to blame for the boom in logging on private lands and native reserves in Alberta. The Forest Conservation Strategy Stakeholders hold a meeting to discuss the deforestation of private and public lands in the White Zone (settled areas). Attendees express concerns including private land cutting, the conversion of public forested land to marginal agriculture land, the export of jobs and profits, the increasing loss of wildlife habitat, damage to watersheds and water quality, and erosion. Marketing Timber: From Private Land In Alberta is “a joint publication of the Canadian Forest Service and Alberta Land & Forest Services pursuant to the Canada-Alberta Partnership Agreement in Forestry,” intended to educate landowners who are considering selling merchantable timber on their land. The Forestry Stewardship Council, an international non-profit organization, is founded to support environmentally appropriate, socially beneficial, and economically viable management of the world’s forests. The Alberta Environmental Network and the Alberta Forest Products Association present Toward the Development of An Alberta Forest Conservation Strategy to Alberta Forestry, Lands and Wildlife. The document outlines the vision, composition, procedure and timeline of the AEN and AFPA Forest Policy Subcommittee. Jerry Bauer of Canadian Forest Products Ltd., and Glenda Hanna of the AWA inform Ken Higginbotham, Assistant Deputy Minister, Alberta Forestry, Lands, and Wildlife, of the meetings between the Alberta Environmental Network and the Alberta Forest Products Association, and the formation of the Forest Conservation Strategy subcommittee. Bauer offered to provide members of the subcommittee to assist in the creation of a Forest Conservation Strategy. This appears to be the first formal involvement with government agencies in the creation of a Forest Conservation Strategy. At a meeting of the Alberta Environmental Network and the Alberta Forest Products Association, a subcommittee is formed to work on a Forest Conservation Strategy. A federal court declares a logging lease in Wood Buffalo National Park illegal, stopping clearcut logging in the park. The suit was filed by the Sierra Legal Defence fund. The Canada-Alberta Partnership Agreement in Forestry is signed by the governments of Alberta and Canada. It is a 3-year agreement focusing on Reforestation & Intensive Forest Management; Research and Technology Transfer; and Public Information, Education, and Agreement Support. The partners contribute $15 million each. The Government of Alberta is a signatory to the Canada Forest Accord. The Canada Forest Accord is a formal commitment among diverse groups with different perspectives and objectives to work together on solutions to the challenges facing the forest. The Daishowa case (see March 1990, below) goes to trial in Edmonton and continues to October 18. The applicants are unsuccessful in their challenge to the agreement between the province and Daishowa. The province considers joining the national Heritage Rivers Program and placing the Athabasca River under its protection. This is amid the controversy surrounding the building of the Al-Pac pulp mill northern Alberta. Meetings began between representatives of Alberta Environmental Network and the Alberta Forest Products Association. Among the broad mandates that both groups possess is the intention to protect nature. These meetings eventually led to the formation of the Alberta Forest Conservation Strategy. The Canada-Alberta Partnership Agreement in Forestry is signed. It is a 5-year agreement worth $30 million, and expires in 1995. The federal government announces that the Department of Fisheries and Oceans will spend up to $250,000 on a background study to learn more about the effect of clear-cut logging in the Prairie provinces will have on fish and fish habitat. The Alberta Government announces a new policy for public involvement in forest management policy. The policy states that public involvement is mandatory for all companies holding forest management agreements. The Complementary Scientific Review of the Proposed Alberta-Pacific Pulp Mill Project Environmental Impact Assessment is completed. The primary purpose of the project was to “review all of the available data on the effects of chlorinated organic compounds and the biological oxygen demand that would be discharged in the pulp mill effluents.” Basing its conclusions on existing mills and mills under construction, the report suggests that the overall environmental impact of the mill would be minimal. The University of Alberta Department of Forest Science publishes Forest Management in Alberta, a report of the Expert Review Panel. The members of the review panel are Lorne Brace, a forest research scientist; John Stelfox, a wildlife research scientist; Bob Udell, a professional forester; and Bruce Dancik (chair), a University of Alberta forestry professor. The Executive Summary suggests that the panel is quite critical of the Alberta forestry industry and its practices; the report concludes with 133 recommendations for action. A case is brought before the provincial court disputing the validity of an agreement between Daishowa Canada and the province regarding use of forested lands. Applicants in the case include Dianne Pachal of the AWA, Peter Reese, the Peace River Environmental Society and the Sierra Club of Western Canada. The applicants charge that the agreement between the province and Daishowa is void because it does not meet the requirements of the Forest Act; specifically, the Daishowa Forest Management Agreement does not indicate how the forests will be managed to ensure a perpetual sustained yield of all forest benefits. Motion 209 is moved in the Alberta Legislature by Grant Mitchell (MLA, Edmonton-Meadowlark). The motion states that the Legislature urge the government place a moratorium on construction of pulp and paper projects in northern Alberta until (a) an environmental assessment process is implemented, and (b) it is possible to ensure that emissions to water and air from these projects will have a negligible environmental impact. The debate is adjourned. LeRoy Fjordbotten announces the formation of Alberta’s Expert Review Panel on Forest Management. The members are Dr. John Stelfox of the Alberta Fish and Game Association; Dr. Bruce Dancik of the University of Alberta; Lorne Brace of the Canadian Forestry Service; and Bob Udell of Weldwood. (The panel issues a report in May 1990). A controversy ensues when it is learned that two Alberta public servants head organizations that have entered the battle against environmentalists over development of the province’s forests. Chuck Geale, director of program support for the Alberta Forestry Service, is president of the Alberta Forestry/Non-Government Association; Ken Higginbotham, director of forestry research at the Alberta Forestry Service, heads up the Alberta Registered Professional Foresters’ Association. Forestry Minister LeRoy Fjordbotten denies there is a conflict of interest. Deputy Forestry Minister Fred McDougall leaves his government position to join U.S.-owned Weyerhauser Canada. He is instructed by Forestry Minister LeRoy Fjordbotten not to take part in any timber negotiations before his departure on June 30, but insists that there is not conflict of interest. Negotiations begin on “tough regulations to ensure Alberta’s timber harvest is replaced with new trees,” according to the John Drew, the province’s reforestation director. Alberta requires its pulp and paper industry to implement environmental standards which are reflective of leading edge technology. The goal is to reduce the production of dioxins and other organic compounds and minimize their release into the environment. The Alberta Government announces a new policy designed to give Albertans increased participation in the development of timber harvesting plans. Alberta forest companies agree to broaden membership in their [unnamed] association, to include pulp and paper makers and panelboard manufacturers in the association of lumber producers. The move part of an attempt to answer criticism levelled by environmental groups and other opponents. The National Forest Sector Strategy for Canada upholds the tenets of the 1981 Forest Sector Strategy for Canada; it is adopted by the Canadian Council of Forest Ministers. The Alberta Government announces the establishment of a Forest Industry Development Division, created to meet two main objectives: to assist new and existing forest companies and private investors to expand and utilize Alberta’s vast “uncommitted forest resources” for a variety of forest products, and to attract investment and private sector involvement in developing our renewable resources other than forests – for example, outdoor recreation. Alberta Forestry, Lands and Wildlife is created as a separate department out of the renewable resources sector of Alberta Energy and Natural Resources. The Burgess-Lane Memorial Lectureship in Forestry, Forest Management in Alberta, is presented by F. W. McDougall [Deputy Forestry Minister for Alberta] The report provides good historical background information regarding land use policies and Forest Management agreements, as well as now historic information about the level of activity in Alberta’s forest industry in 1986. The report generally favours growth in and expansion of the forest industry, and points out the untapped forestry resources in the northern Boreal forest. The report is entirely in favour of expansion of forestry activities in Alberta; references to wildlife speak to hunting and trapping opportunities with no discussion of conservation. Regarding the newly-established Kananaskis Country, the author notes his “concern over the possibility that large areas of forest will be allocated exclusively to recreation, and exclude forest management for other benefits.” Several references are made to the Eastern Slopes Policy. The Canadian Council of Forest Ministers is established. The Alberta Registered Professional Foresters Association is established under the authority of the Forestry Profession Act. The Canada-Alberta Forest Resource Development Agreement is signed under the Economic and Regional Development Agreement, for a five-year term worth $23 million. An article by J. Owen Saunders in Resources, the newsletter of the Canadian Institute of Resources Law, notes that the Alberta Forests Act of 1980 is “remarkably silent on the procedures to be followed by the government prior to allocation such a major block of Crown resources,” and points out the more stringent procedures of the British Columbia Forest Act. The BC Act requires greater transparency and public involvement. Energy and Natural Resources Alberta publishes Forest Renewal: Taking Care of Tomorrow’s Forests Today. This publication explains the concept of Sustained Yield Forest Management which has been adopted by the provincial government. The booklet describes how a continuous supply of marketable trees can be provided by controlling the balance between the volume cut and the new growth – basically, reforestation. The booklet also explains the importance of Forest Management Agreements, Quota Certificates, and Commercial and Local Timber Permits. The Forest Industry in the Economy of Alberta, 1878-79 is published by the Northern Forest Research Centre, Canadian Forestry Service, Environment Canada. The abstract of the report states: “The forest industry in Alberta was surveyed in 1979. The results are analysed … in terms of forest resources, capital, employment impact, capacity and production, markets, annual revenues and expenditures, and socio-economic impact.” Like the earlier report of 1972, the report does not deal with environmental impact. A Forest Sector Strategy for Canada is issued; the federal role is to decrease international trade barriers, ensure a positive climate for investment, improve the resource data base, maintain forestry research and development, support provincial forest renewal programs and provide national forestry statistics. Alberta’s forestry industry expands to five times what it had been in the 1970s; expansion occurs primarily in northern Alberta. Expansion is fueled by in part by the collapse of oil prices in the early 1980s; forestry was seen as a way to diversify and stabilize the provincial economy. Another factor was the development of new technologies that enabled the cost-effective pulping of hardwood species such as aspen; aspen is the most common tree species in northern Alberta. Following public hearings held in 15 centres in western Alberta regarding forestry operations, the The Environment Council publishes The Environmental Effects of Forestry Operations in Alberta. The AWA’s submission to the Council is included in AWA Newsletter 9(2) Fall 1979. Joint federal-provincial seven-year reforestation program is established under the Maintaining Our Forests Program, worth $25 million. (Prior to the public hearings, the Environmental Conservation Authority publishes a series of Information Bulletins providing background information on Alberta’s forestry industry). A National Forest Regeneration Conference is convened in response to concerns over forest regeneration and the availability of long-term timber supplies. Policy for Resource Management of the Eastern Slopes is adopted. Forest Utilization and its Environmental Effects in Alberta is published by the Environment Conservation Authority. It is Information Bulletin #6, one of eleven bulletins pertaining to public hearings on The Environmental Effects of Forestry Operations in Alberta. When it was presented at the hearings, it was considered to be of interest “because of its historical nature;” the Environment Conservation Authority distanced itself from the contents of the report. The Economic Importance of Sawmilling and Other Primary Wood-Using Industries in Alberta is published by the Northern Forest Research Centre of the Canadian Forestry Service, Environment Canada. The purpose of the report is “to better understand the size of Alberta’s forest industry and its economic impact on the provincial economy,” by assessing employment, salaries and wages, sales, products, and value added. The report does not deal with environmental impact. The Canadian Council of Resource and Environment Ministers lobbies for the development of a national forest policy, and promotes the adoption of sustained yield forest management. The Forests Act retains types of tenure and quota system. An Act to amend the Forest Act makes provision for deciduous timber quota certificates, and for the calculation of coniferous and deciduous volumes within management units. It also states that a FMA is designed to promote the growth and harvest of timber on a perpetual sustained yield. Provincial opposition to the conditional grant program, and constitutional barriers to an increased federal role in direct forest regulation, lead to the dissolution of the Department of Forestry; this was also the end of the shared-cost forestry programs which had been in existence since 1951. The federal Department of Forestry convenes the second National Forest Congress. “Mandatory reforestation was extended to the entire province with the introduction of the quota system.” From the program for the conference “The New Regeneration Standards,” CIF, Rocky Mountain Section, Sept. 14 & 15, 1990. An Act to amend the Forest Act states that a Minister could only exercise amending power in the interest of good forest management upon 30 days notice or with consent of the licensee. The federal Department of Forestry is created in under the Department of Forestry Act; it assumes responsibility for forest research, the funding of reforestation, fire protection, silviculture and inventory surveys. An Act to amend the Forest Act extends provisions for pulpwood agreements in the 1949 legislation to timber suitable for plywood. North Western Pulp & Power signs the first Forest Management Agreement in Alberta. An Act to amend the Forest Act requires licence holders to submit annual cutting plans for approval and introduces manufacturing requirement on sawlogs. The Forests Act is proclaimed, and new policies implemented, including area-based agreements, 20-year renewable leases, and sustained-yield management. A detailed forest inventory is initiated to define the available wood supply (a requirement for attracting large forestry projects). The Forests Act gives jurisdiction over the control and administration of public lands, timber and forest fires to the Department of Lands and Forests. It provides for timber berths and licences, as well as permits. It makes the first provision for forest management licence – the continuous leasing of a designated area as long as the holder practices sustainable yield forestry. It provides authority for the government to enter into agreements for the disposition of pulpwood with a company involved in manufacturing. It allows for long term agreements in exchange for construction or manufacturing activities. All timber acquired under the Act (except for dry pulpwood) is to be manufactured in the province. The Alberta Forest Service is established, providing the basis for administering and servicing the expanding forestry sector. The Green Zone, which restricts the encroachment of agriculture onto lands best suited for forestry, is also established. The Eastern Rocky Mountain Forest Conservation Board is established jointly by the federal and provincial governments to address fire protection and regulation of harvesting. The Alberta Forest Products Association is established. A non-profit organization, the AFPA represents most of the companies that manufacture lumber and related wood products in Alberta. The AFPA promotes the lumber industry, oversees quality control, is concerned with health and safety issues, and acts as an information resource, works with associations, organizations, and others who use forests. The Department of the Interior is disbanded and federal forest administration is transferred to the Lands, Parks and Forest Branch of the Department of Mines and Resources. The Alberta Forest Reserves Act is passed; the Lieutenant-Governor-in-Council is empowered to establish forest reserves for the maintenance, protection and reproduction of lumber, animals, birds and fish. The Alberta Natural Resources Act is passed. The Natural Resource Transfer Agreements transfer jurisdiction over natural resources to the governments of the three prairie provinces, retaining power over the administration of Crown lands in the Yukon and Northwest Territories (as well as some federal lands within the provinces: reserves, national parks and military bases). The Canadian Institute of Forestry is established; the Rocky Mountain Section services Alberta. The Constitution Act grants each province ownership of “lands, mines, minerals and royalties.” This marks the first step away from what had been a period of unregulated exploitation, and marks the beginning of a period of “regulation for profit and revenue enhancement.” From 1867 to 1930, the federal government holds considerable influence on forest management, as it owns Crown lands in the territories and three prairie provinces. The idea of wilderness needs no defense. It only needs more defenders. Receive up-to-date information and action alerts on wilderness issues in Alberta. Receive notice of deadlines and time frames when your voice will have the biggest impact. Be asked to contact decision-makers to make sure that your voice is heard.